The West Avenue Annex was the Survey's off-campus home from 1982 to 1998. When the Arkansas Archeological Survey (ARAS) was created by the Arkansas General Assembly in 1967, its first Coordinating Office (CO) occupied a single room in University Museum quarters on the 4th floor of Old Main. Bob McGimsey and Hester Davis made sure that a sign bearing our first logo was posted in the hallway just outside the door. 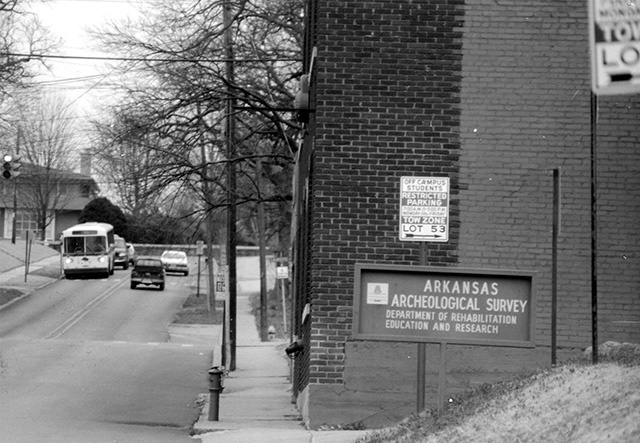 As the CO grew in size, expanding the Registrar’s Office that maintains the state archeological site files and adding Sponsored Research and Computer Services programs, larger quarters were made available on the University of Arkansas (UA) campus first in Vol Walker Hall and later in Hotz Hall, a men’s dormitory building. In 1982, ARAS moved into West Avenue Annex, a converted shirt factory the university acquired just off campus. When Tom Green was appointed ARAS Director in 1992, we were again running out of room in our designated quarters. 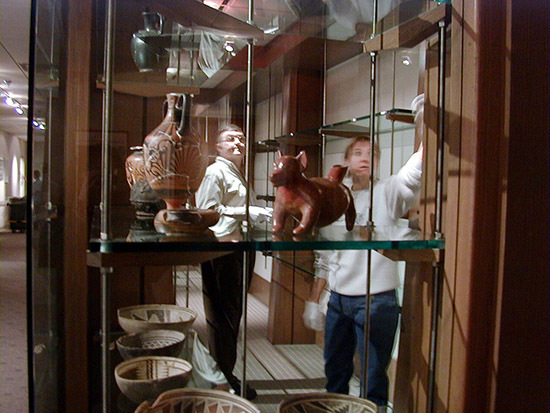 Suitable curation space for artifact collections and lab and office space for a growing staff had become critical concerns. At the encouragement of Dr. B. Alan Sugg (UA System President) and Ms. Joyce Wroten (UA System Vice President for Government Relations), Tom prepared a request for funds to construct a new facility dedicated to housing ARAS CO operations and collections. 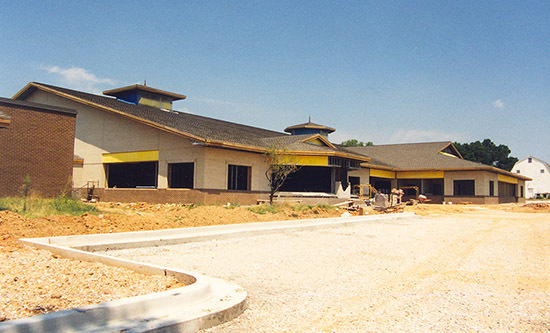 During the 1996 legislative session, the General Assembly recognized ARAS’s contributions to heritage study and preservation in the state by awarding $4.1 million for construction of a new building. Space for the new CO was made available on UA Division of Agriculture property north of the main campus, alongside the Biomass Research Center. Planning with Cromwell Architects Engineers commenced. The new ARAS building under construction in 1998. The Survey moved in to its new offices in early 1999. The Arkansas Archeological Survey's new logo was incorporated into the building façade. In the course of our planning, ARAS also took into consideration the circumstance that the extensive University of Arkansas Museum collections were housed in a campus building, Vol Walker Hall, slated for conversion to an updated home for the School of Architecture. Those collections, too, would eventually have to be moved. Accordingly, ARAS, UA System, and UA campus administrators negotiated an agreement whereby the campus would contribute additional funds enabling an expansion of the new curation facility to accommodate both ARAS and Museum collections. Since ARAS (an independent unit of the UA System) and the Museum (a unit of the UA Fulbright College of Arts and Sciences) are administratively separate, special access and control measures were put in place for the new University of Arkansas Collection Facility. Construction on the 27,621 square-foot building was completed late in 1998, this time with the new ARAS logo incorporated into the building façade. The Survey moved in to its offices early in 1999, with office and lab space comprising 51% of the building footprint, or 14,087 square feet. 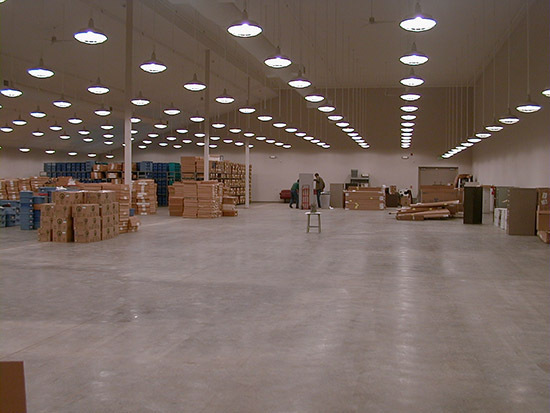 The Collection Facility was constructed over the remaining 13,534 square feet. 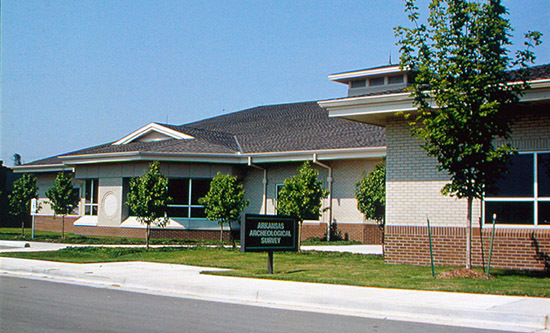 Museum personnel were provided office space in the adjoining Biomass Research Center and in 1999 they also moved collections into the newly finished curation space. The 13,534 square foot Collection Facility before the installation of shelving. Over 20 million objects are now housed in this climate-controlled space. UA museum curator Mary Suter setting up the open storage displays in the new ARAS building. The “new” CO building (now 19 years old) currently houses the ARAS Director, State Archeologist, Fiscal Affairs, Registrar, Computer Services Program, Sponsored Research Program, Publications Program, Photographic and Graphic Arts, and Survey/Society Liaison offices, along with the Central Lab and UAF research station offices and lab. The University of Arkansas Collection Facility is a secure, climate-controlled area that adheres to federal curation guidelines. It currently houses approximately 7,200 cubic feet of ARAS collections and 6,900 cubic feet of University Museum materials. The combined collections approach 20 million objects. Both collections include tens of thousands of items of enormous importance to the study of Arkansas history and culture, University of Arkansas history, and the natural history of the state and region. The collections are continually in use for research, teaching, and display purposes, and often serve as a primary resource for cutting-edge, world-class developments in science, humanities, and education.